Eric Bright’s one-of-a-kind guitars start as rare spruce logs from the bottom of a lake. Published on Friday, January 26, 2018. This article appears in the December/January 2018 issue of American Craft Magazine. When Eric Bright pulled a piece of American history from the muck at the bottom of a lake a dozen years ago, he had no idea he’d unearthed a prized material – one that would eventually fuel his second career. Bright and his wife live on Schroon Lake, which is carved into the forests about 50 miles south of Lake Placid in New York’s 6 million-acre Adirondack Park. 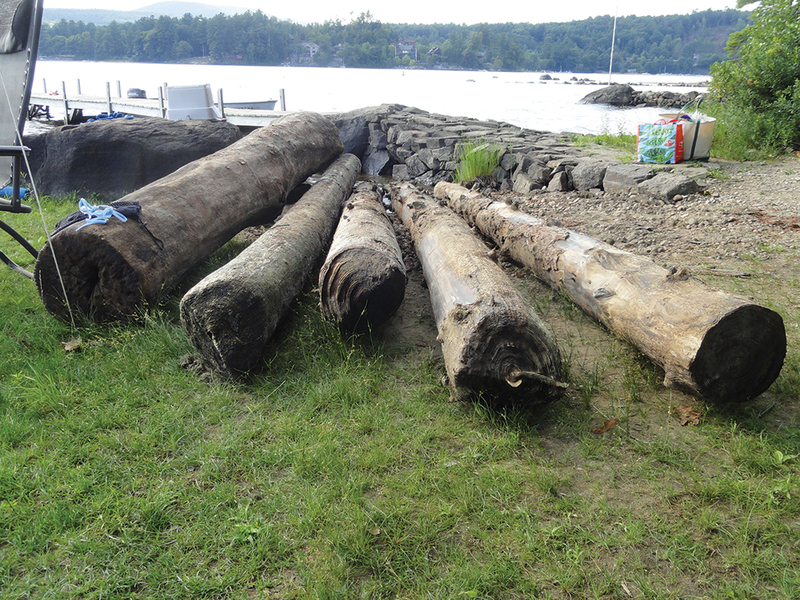 He was reading about the area’s 19th-century logging industry, when timber was cut to specific dimensions and floated down to the sawmills along the Hudson River, and he remembered seeing a submerged log near the shore. “I went out and measured it, and it was exactly 13 feet, 4 inches long,” he says – the same measurements he had just read about. Bright hauled the log to shore, then largely forgot about it until he took a guitar-making course a year later. Seeking to test his new skills by building his own instrument, Bright sliced the old log, which he thought was oak, and brought some of it to his teacher for planing and sanding. “He said ‘This isn’t oak, this is spruce. This is gold for the top of guitars,’ ” Bright recalls. Martin Guitar, one of the top American manufacturers, had made Adirondack red spruce famous for its tonal quality, using it on the tops of its acoustic guitars. But the soft wood with the tight grain has been hard to find for decades. Bright honed his guitarmaking skills slowly, building one or two a year. But in 2009, after he retired from his career as a special education teacher, he started seriously pursuing his new calling as a luthier. The 66-year-old now spends time each summer in a 14-foot aluminum boat, trolling 9-mile Schroon for “sinker” spruce preserved at the bottom of the lake for 150 years or more. Many of the logs are stamped with the original logging company’s name. Some years he finds just one or two worth harvesting, but last year he hauled up eight spruce logs with the help of his daughter. He says the time in the silt “does magical things” to the wood. 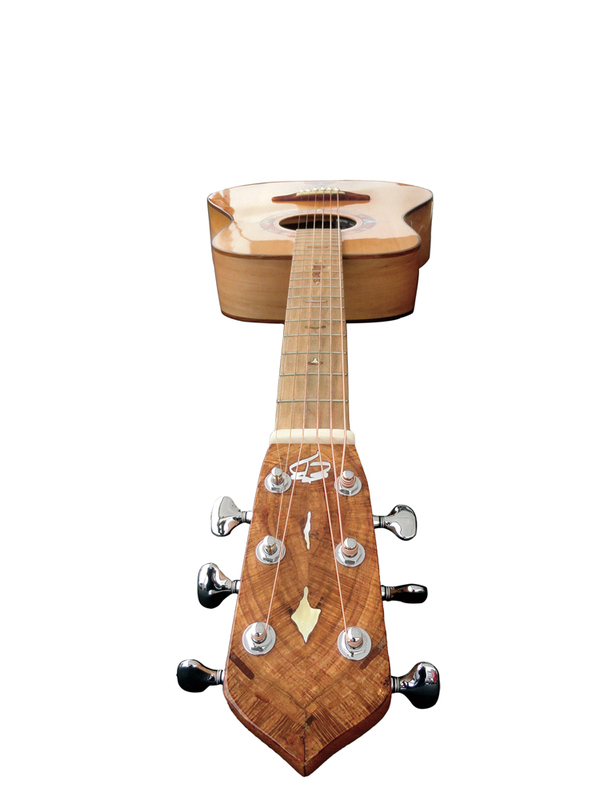 Bright can get enough top wood to build a dozen to three dozen guitars from a single well-preserved log. His workshop is a converted boathouse beneath his home, where he assembles six to 12 guitars each year. Along with the sinker spruce, Bright mostly uses local wood, primarily maple and red oak found on his property. His creations sell for $4,000 to $6,000 apiece. It may sound like a lot, but the level of detail in a hand-built guitar simply isn’t possible in a mass-produced instrument. 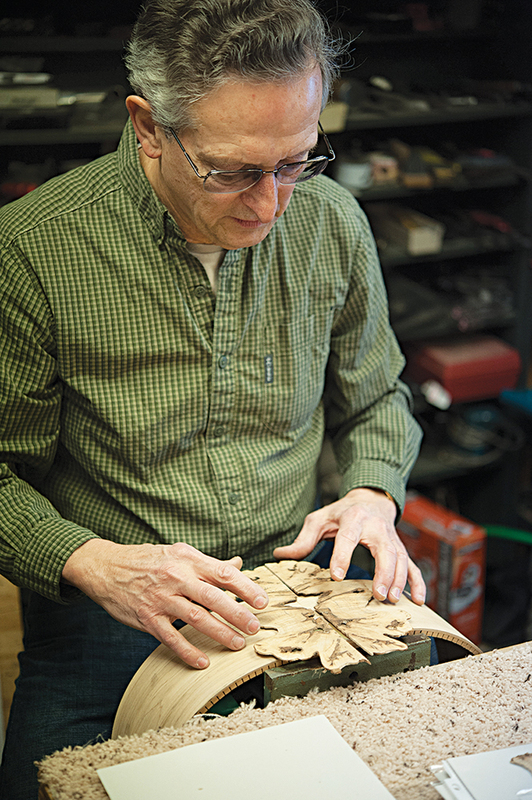 “Every piece of wood is different, and when you have a luthier-built guitar, you have someone bracing the wood just right, paying attention to every piece,” he says. Before he posts new guitars on his website, he gives them each a name from a list of classic women’s names from the 1800s to reflect the era of the spruce – Lila, Anna, and Rosemary are among those in his inventory. George Parrott, a performing guitarist who splits his time between Florida and New York, owns Judith, which features an extra-wide neck and a high-end, specially installed pickup. “His attention to detail on the whole guitar is amazing,” says Parrott, whose collection of 30 guitars makes him a bona fide connoisseur. 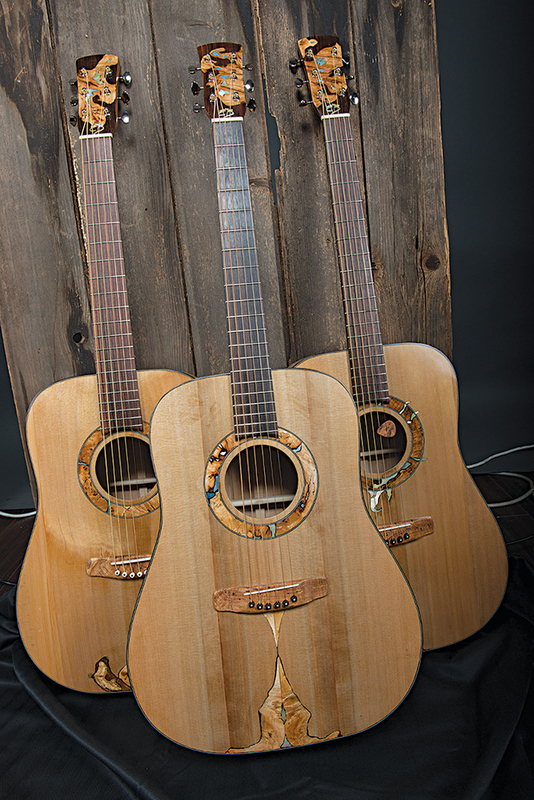 “Sinker” spruce logs – remnants from an 1800s logging operation in the Adirondacks – give Bright’s guitars both their look and their singular sound. 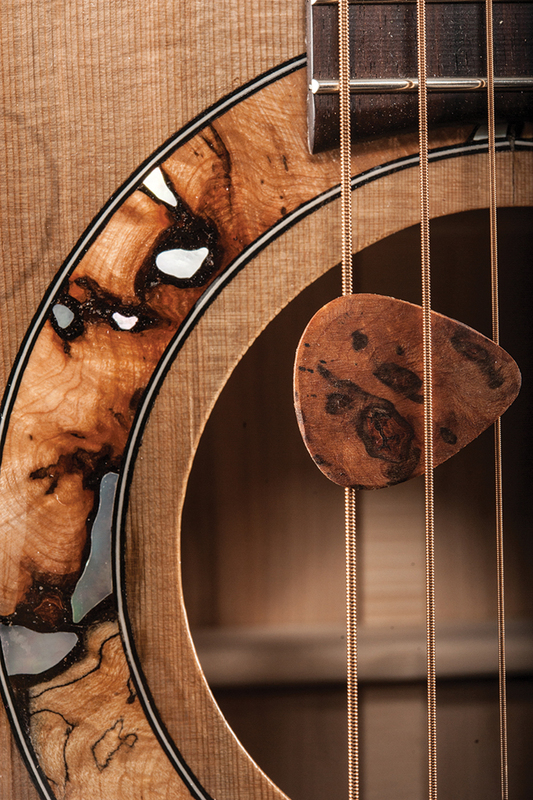 A rosette of pearl and maple burl circles the sound hole on Rose. The pick is made of leftover burl. Tess, Jane, and Emma are “sisters” made from the same 150-year-old spruce. Though they share a general style, each has distinctive designs.